What Are the Best Exercises for Parkinson's Disease? 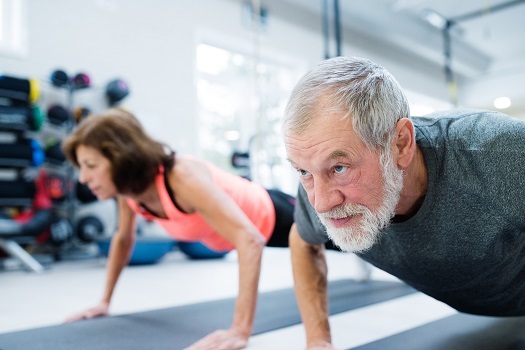 Seniors with Parkinson’s are generally encouraged to engage in various types of physical activity to maintain muscle strength, flexibility, and mobility. Exercise is known to help with balance and prevent joint stiffening. However, seniors must carefully choose activities suited to their needs and abilities and monitor the intensity and duration of their workouts to prevent overheating and fatigue. Here are some exercises that are perfect for seniors with Parkinson’s disease. Exercises that put the hands and wrists through the complete range of motion help seniors maintain fine motor skills. This way, seniors with Parkinson’s have less difficulty getting dressed, writing, or accomplishing other tasks that require dexterity and flexibility in the hands and fingers. To do hand exercises, seniors should alternate fully extending the fingers with making a fist, extending the arms and fingers, then making a fist and pulling the arms close to the body. They should alternate bending the wrists and hands downward and upward with fingers fully extended. These exercises should be performed in the morning before breakfast. Joint stiffness and muscle weakness often worsen as the disease progresses. Doing step ups helps seniors with Parkinson’s maintain balance when standing by strengthening leg muscles. Seniors can use a simple step or stand at the bottom of a staircase. The exercise involves holding onto a railing or a chair back for support if necessary, then stepping up with one foot and balancing on the single leg, then stepping down and using the alternate leg to repeat. Seniors should perform ten sets a minimum of two times a day. Even seniors in the advanced stages of Parkinson’s can still get the benefits of exercise, especially with the help of a trained professional caregiver. Rhode Island elderly home care professionals can be a wonderful boon to seniors. Whether they require around-the-clock supervision or just need assistance with exercise and household tasks a few days a week, seniors can enjoy a higher quality of life with the help of trusted in-home caregivers. By exercising the torso, seniors ensure the trunks of their bodies stay flexible, which is vital for balance. The activity simply requires older adults to stand with feet apart and arms outstretched while holding a broomstick or similar object, slowly rotating the body to the right as far as possible, then turning to the left. The exercise should be repeated up to 15 times and performed twice a day. If you usually help your loved one exercise but need a break now and then, consider having a professional caregiver take over for you. Rhode Island respite care professionals can assist seniors with a wide array of daily tasks, offering family caregivers the chance to focus on other personal responsibilities or take a break to prevent burnout. Whether it’s for a few hours a day or a few days a week, respite care is the perfect solution for family caregivers who are feeling overwhelmed. A Cleveland neuroscientist discovered that pedaling at a high rate diminishes symptoms in seniors with Parkinson’s. He recommends that seniors ride a traditional or stationary bike for up to 40 minutes a session three times a week for optimal benefits. The exercise increases the quantity of information the brain receives, which stimulates the production and release of neurological transmitters and proteins that play vital roles in cognitive and motor functions. Cycling prevents freezing and strengthens leg muscles while enhancing joint movement, which is necessary for standing, balancing, and walking. The activity is also ideal for getting aerobic exercise that benefits cardiovascular health. Whether swimming laps or taking part in a water aerobics class, being in the water benefits the body from head to toe. The water provides just enough resistance to strengthen all the large muscle groups while not stressing weight-bearing joints. The activity enables seniors with Parkinson’s to maintain overall range of motion, balance, and flexibility while strengthening the cardiovascular system. Seniors with Parkinson’s who need assistance to exercise safely can benefit from the help of a trained professional caregiver. Rhode Island senior care experts are available to provide high-quality care to seniors on an as-needed basis. From assistance with mobility and exercise to providing transportation to the doctor’s office and social events, there are a variety of ways professional caregivers can help your aging loved one continue to live independently. If your loved one needs professional care, Home Care Assistance is here to help. To hire a compassionate, dedicated caregiver, call us at (401) 284-0979 today.